the HX OUTDOORS was designed around the fundamentals of military survival training. Featuring a fine edge,the MERCENARIES Fixed Blade's black ceramic coating offers superior corrosion resistance and minimizes reflective surfaces. Its 3.85 inch fine edge drop point blade serves to slice and rip with precision. The compact skeletal fixed blade is sized for a subtle presence, and can be worn without making a profile against your outer clothing. G10-Composite fiber Ergonomic handle minimizes user fatigue , allowing for a superior grip in critical situations. 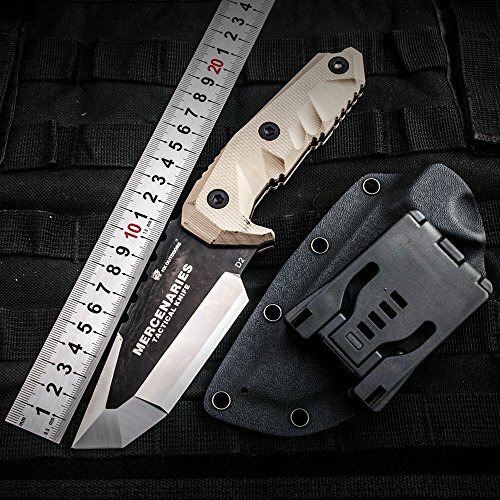 MERCENARIES is an self defense knife with a sheath system configurable for low profile or open carry. The sheath system can be worn horizontally on the belt or vertically on a belt like a traditional fixed blade knife. Simply detach the belt loops from the grommet holes and arrange them as you please. Know your local laws before you decide how to carry. If you have any questions about this product by HX outdoors, contact us by completing and submitting the form below. If you are looking for a specif part number, please include it with your message.